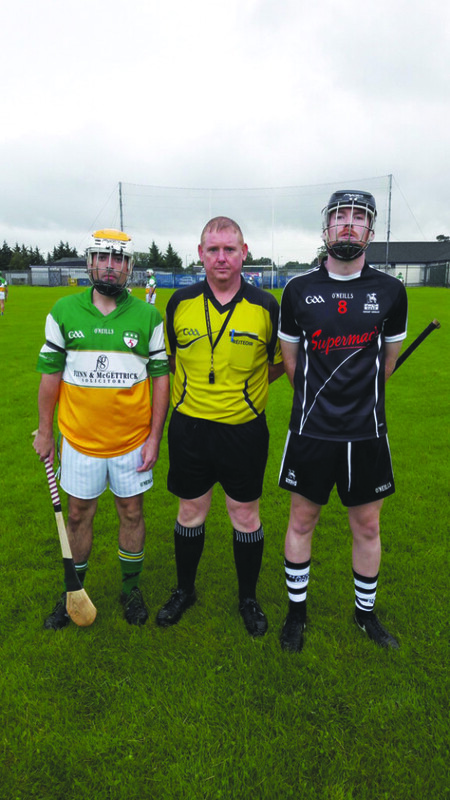 MICHAEL Davitt’s booked their place in the Junior B Hurling final with a hard-fought two-point win over West Belfast rivals St Agnes’ at McDonnell/Doherty Park last night. A thunderstorm prior to throw-in led to difficult playing conditions, but both teams were fully committed in a typically hard-hitting derby game. Davitt’s were the better team for the majority of the first half with Christopher Gallagher (two), Rory McEvoy (two) and Alan Rainey all on target for the Falls Road men in an impressive opening quarter. St Agnes’, in contrast, were reliant on midfielder Ronan Carroll to keep them in touch from placed efforts as he slotted over a free and two 65s. A brace of frees from Stephen McGivern helped Davitt’s open up a five-point lead as the game threatened to slip away from Aggies. However, the Andersonstown men fought back gamely in the closing stages of the first half. A scrappy goal from centre-forward Conor McLean was flanked by two fine scores from play from corner-forward Kevin Grieve as St Agnes’ took an unlikely 1-6 to 0-8 lead into the break. McGivern’s first point from play levelled matters on the restart, but the second half lacked the fluency of the first with the majority of scores coming from frees. Hugh Grieve Jnr and McGivern exchanges frees before Aggies substitute Colin Mallon forced a great save from Sean Smyth. The warning was heeded as Davitt’s, once again, pushed for home. Excellent long-range frees from McGivern and Christopher Gallagher moved Davitt’s ahead before they bagged a crucial goal. Gallagher and Canice Mooney teed up full-forward Thomas Óg Toland for a shot on goal, but his first-time effort was blocked. However, Toland was quick to pull on the rebound and direct the sliotar into the net. Another free from McGivern looked to have sealed the win for the defending Junior B champions. But to their credit, Aggies refused to accept their fate. A 65 from Carroll was dropped in on top of the Davitt’s defence. Kevin Grieve was first to get a shot away, but his effort was blocked down. Christopher McKee struck next and his effort slipped through a wall of Davitt’s defenders to close the gap to two on the hour mark. Davitt’s were forced to defend for another three minutes of injury-time, but Aggies were unable to engineer another shot on goal with full-back Anthony Rowntree charging down a final effort from Grieve. Davitt’s now progress to play All Saints Ballymena in the decider on Sunday at 3pm at St Enda’s. DAVITT’S: S Smyth; G Cosgrove, A Rowntree, L McHugh; E Gallagher; T Maguire, G Nelson; C Mooney, M Tully; C McKee, S McGivern 0-7 (0-6fs), A Rainey 0-1; C Gallagher 0-3 (0-1f), T Toland 1-0, R McEvoy 0-2. ST AGNES’: C Fay; S Quirke, M Robb, D McConnell; B Keatings, J Fleming, M Carlin; R Carroll 0-4 (0-2 ’65s, 0-1f), C Flannery; C Pelan, C McLean 1-0, M Caldwell; H Grieve Jnr 0-2 (0-2fs), C McKee 1-0, K Grieve 0-2. Subs: D Mac Giolla Earnáin for Caldwell (HT), C Mallon for McLean (39mins), J Morgan for Quirke (54mins).